A statement dress that scores high on both looks and comfort! The fitted halter neck bodice is crafted from a luxurious off white satin. Two maroon blooms sit prettily on the chest. The skirt features a net overlay with golden stars gathered to perfection. 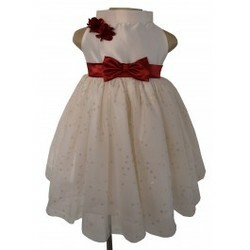 This simply divine dress is an elegant choice for your baby girl’s parties and special occasions. This Beautiful kids wear online Available at Faye India.